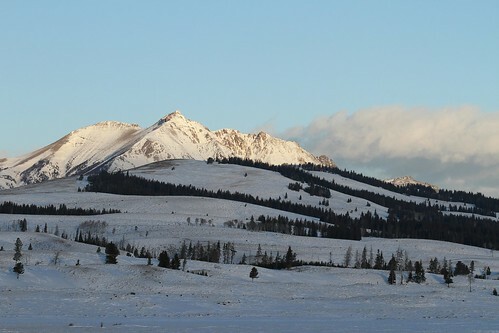 As we made our way out of the Mammoth area via snowcoach, we knew we were in for a grand adventure. At Swan Lake Flats we were all amazed with the tracks in the snow made by the wind as the sun rose over our shoulders. Throughout our journey we have seen the tracks left by generations of fire in the park. New growth shows how new tracks are made by relying on something that is normally considered destructive. These Lodgepole Pines could not thrive if not for the fires thinning out thicker tracks of spruce and firs. In the Grand Canyon of the Yellowstone, a combination of glacial tracks and lava flow are thought to have formed this magnificent landform. Lava flow weakened by geothermal activity was no match for the force of the Yellowstone River or possibly the result of a huge ice dam break. As we made our way toward Yellowstone Lake through Hayden Valley, we unexpectedly went off our own track. High winds blew deep drifts of snow across the road, and our wonderful driver Tamarak fought fearlessly with a drift, but the drift won. Though the incident took us off of our scheduled track, it allowed us the chance to relax and reflect on the fact that nature is the true leader in Yellowstone. 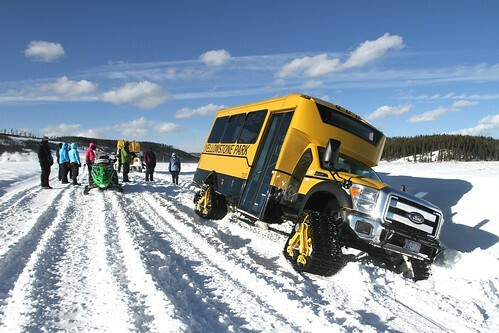 Our snowcoach, off the road! Today definitely wasn’t what we had in mind, but it allowed us to realize that everything around us makes tracks of some sort. Tracks just don’t show up in the snow, dirt, or mud. They are everywhere we look, listen, touch, smell, or taste. Continue to make tracks in your life, but remember your tracks affect everything around you. Carla, Cindy, Rachel, and Michelle K.
Goodness what a mess! Glad to read about the terrific time you are having.